If you are having second thoughts of adding drum floor lamps to your bedroom, this article will change your mind. 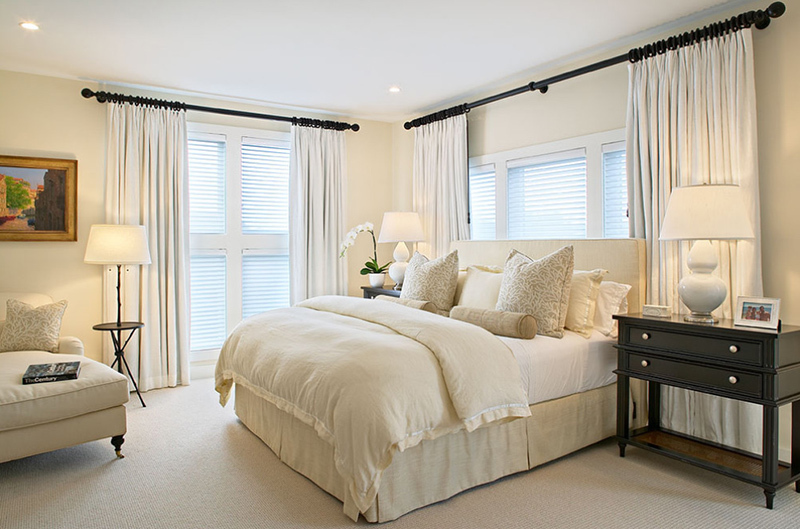 Are you sick and tired of the lighting fixtures that you have in your bedroom? 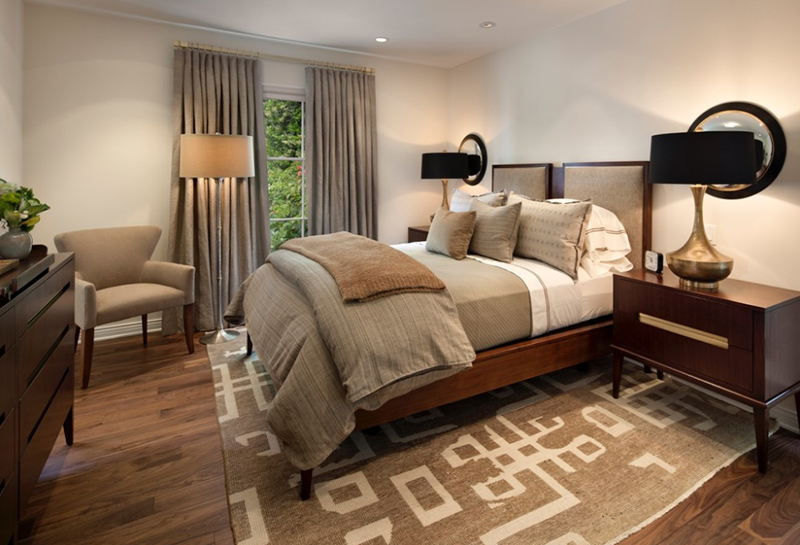 Today, we would be showing off a few bedroom designs with the best drum floor lamps there is in the market. They may seem simple and uninteresting on their own, but seeing them alongside the furniture and decoration choices that both the owner and the designer made for these bedrooms, I think you would really change your mind about this drum floor lamp designs. What if you could replace the lamps you have at home with the drum designs on here? Would you change it? The lamp designs we have on here can actually be done at home – check online and you would be able to find DIY projects to create drum lamp shades for your old lamps at home! Let us go ahead and check out the designs on this list and see which ones you’d like to do for your house! 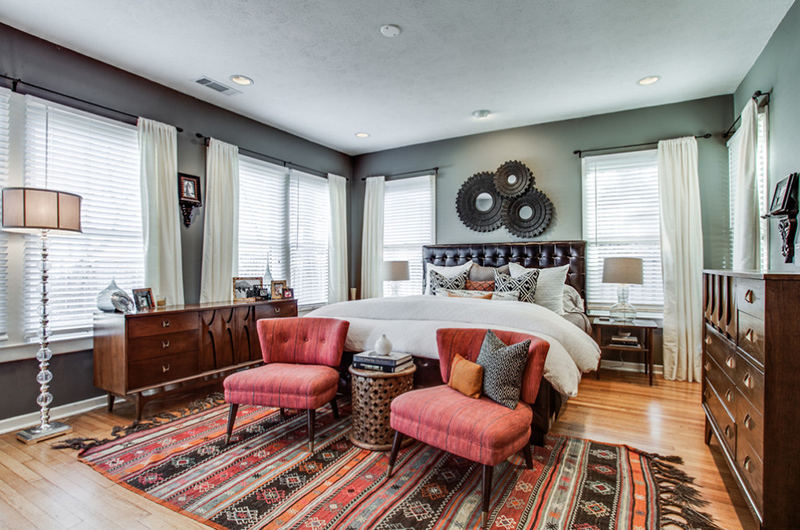 This is one beautiful bedroom with the most gorgeous drum floor lamps I have ever seen. The color of the body of the lamp is just divine paired with black – and then it became a precious piece of furniture that anyone would be envious of! It is common to use multiple pieces of lighting fixtures inside the house – especially in the bedroom and the living room. 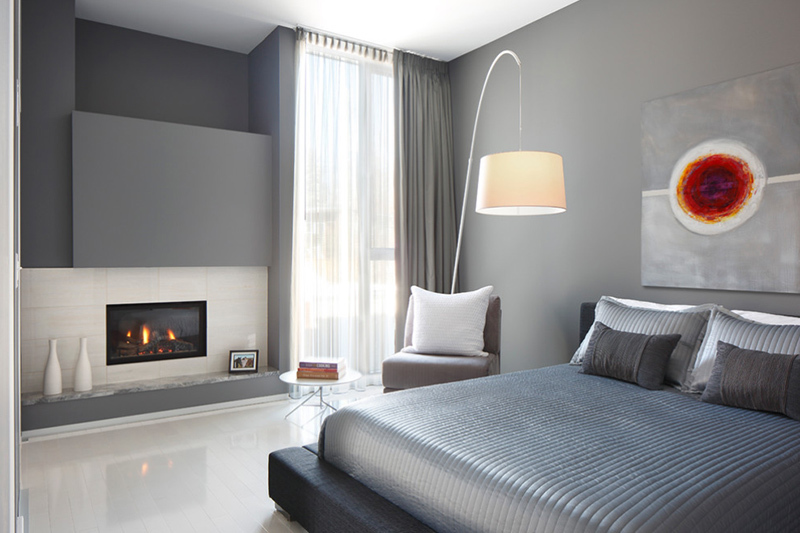 In this bedroom, we see a grey drum floor lamp just behind the wooden accent chair. The design of this floor lamp is sleek and modern – some of the things you’d want your decorations to be. I am astounded with the body of this drum floor lamp! From this angle, I can’t truly say if this is really wood or some artificial material but I think it looks gorgeous and blends well with the entire bedroom. Here is one type of a drum floor lamp that drops from a wire and it’s just too pretty! I like how it contrasts with the color of the bed and the walls and it sure looks like something you see in a magazine. This is one beautiful room to beat! 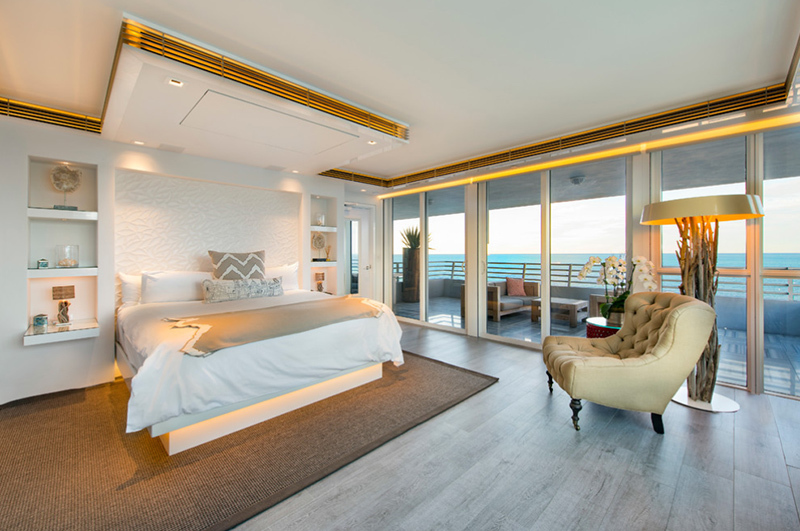 This is an example of a bedroom with multiple lighting fixtures – and if you may have noticed, all the lamps in here are drum lamps in different sizes and types! A drum ceiling fixture, a drum table lamp and drum floor lamp in a tripod! Totally ingenious and stunning! 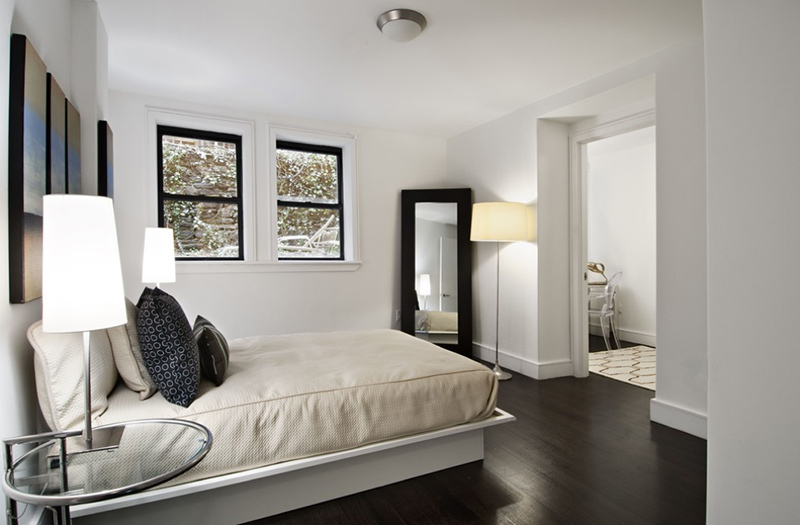 This bedroom sure is an exemplification of beauty and glamour in its most vulnerable and simple ways. A platform bed, chairs for reading or hanging out and a large drum floor lamp to accentuate the space and notice like the bed lamps are like little children of the larger drum floor lamp. This is one beautiful dream home project that you might have seen from Michael Abrams. The color palette used for this space is just so neutral – so calming that when you come after a long day at work, you know that you will be able to really rest and refresh yourself. For a person living in the city, seeing a log house makes me think about a vacation home. The view of the sea outside makes me think that this in fact a vacation home that the owners go to during summers! I love the classic look of the high back chair and that of the drum floor lamp. I think the only rustic feel to this space is the furniture used in it – but the entire thing sure shows elegance at its finest. The art piece behind the head board feels a bit Asian and it sure looks real pretty and interesting. The windows of this bedroom are just wonderful. 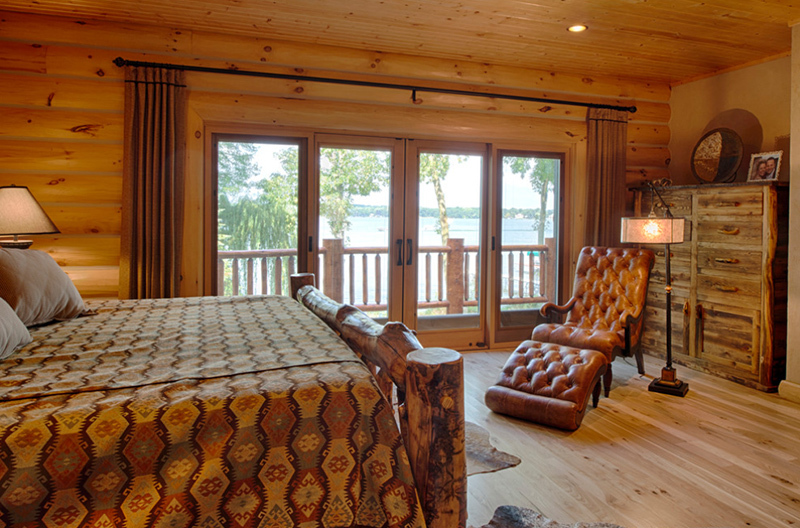 With a view of the outdoors like this one, I think it is just right that the designer and home owner decided to put large windows to this bedroom to be able to see this view every waking day. I totally love how homey this bedroom is! 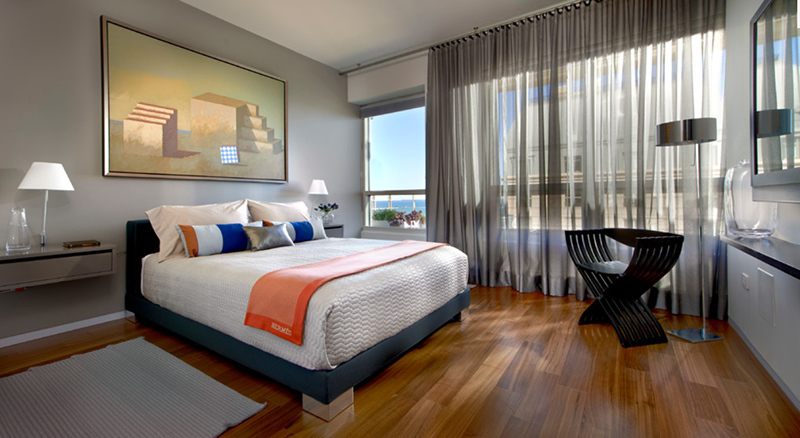 The bed looks so inviting and the fact that this room looks so clean – it makes me want to be in it more! Adding a black side table and a few items that contrast all the white makes this space rather stunning. There are a lot of things that makes this bedroom really interesting and because of the plain walls, flooring and ceiling gives justice to this space because of all the prints you see on the carpet and pillows. Notice that the drum floor lamp is on the left side of the room and looking so pretty. This is one beautiful space to sleep in. The space may seem small because of the fact that there are two single beds in it but this bedroom sure looks and feels like you are always vacationing! 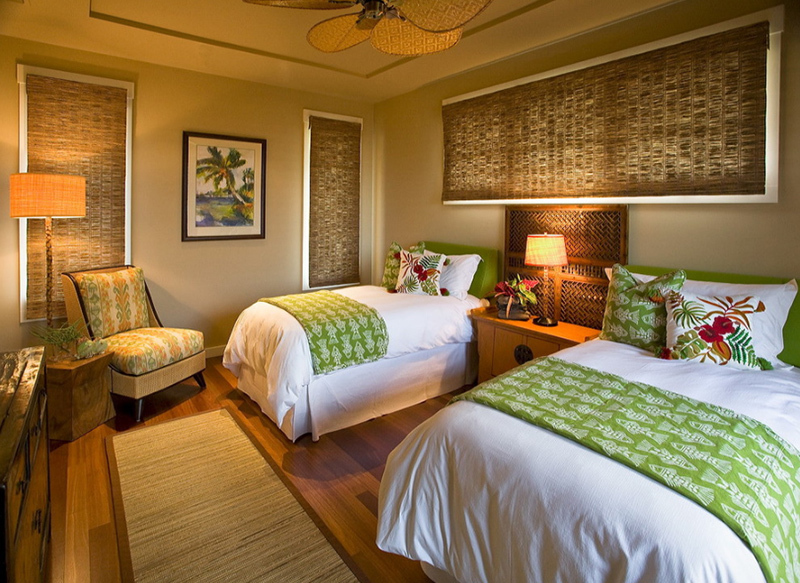 Totally loving this Hawaiian cottage feel! This Montreal loft sure looks homey and comfortable. The bed seems really nice to sleep on in and with a view of the neighboring building, it gives you a feel of the city even when your room has this feel like it is away from the city. Contrasting feeling and look that made this home interesting and fun! Lighting fixtures always create the aura you and your designer would want to achieve. 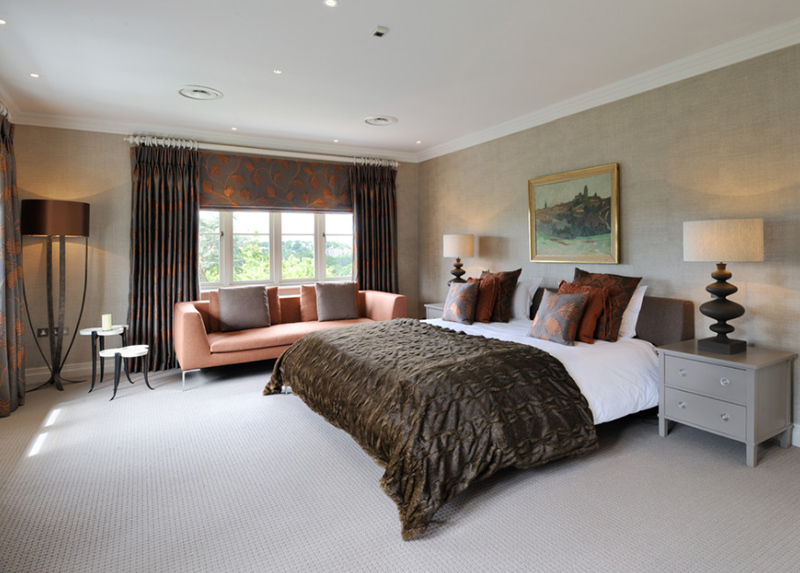 In this bedroom, we can see that the designer used two different styles of lamps – one for the sides of the bed and the other basically to accent the mirror by the door. Drum lamps are usual choices because they can look anything you would want it to be – contemporary, modern and even rustic if they need to be. When I saw this bedroom, I immediately feel that this was intended to look and feel like you are in a hotel room! The color palette is simple but really homey and the choice of lamps is real contemporary and perfect. 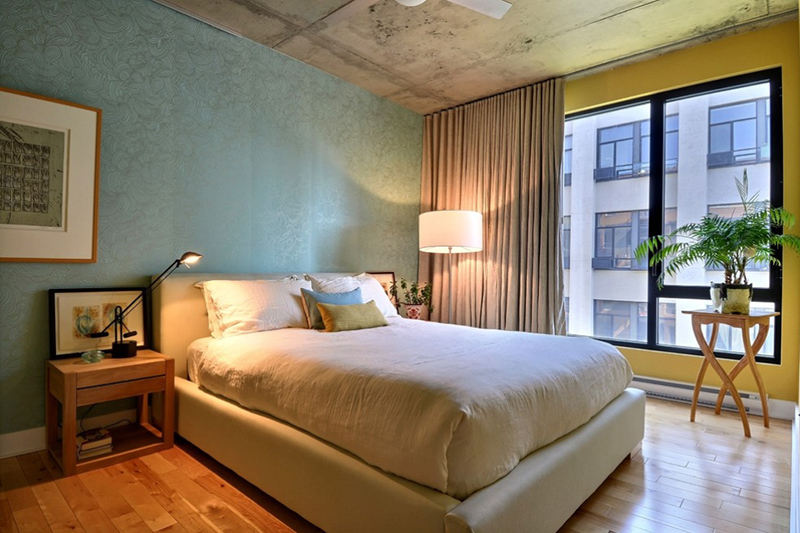 You can also achieve a hotel-like feel in your bedroom through these tips! This is one large bedroom and makes me think that kids are always welcome to come in here and play as long as the parents are with them. The color choices are bold and real mature and dark – a classic! A beautiful Knauf-Koenig Group project which is awesome and actually breath-taking. The contemporary furniture choices are beyond stunning and this place is just fascinating. People who would be seeing this space would definitely fall in love with it! 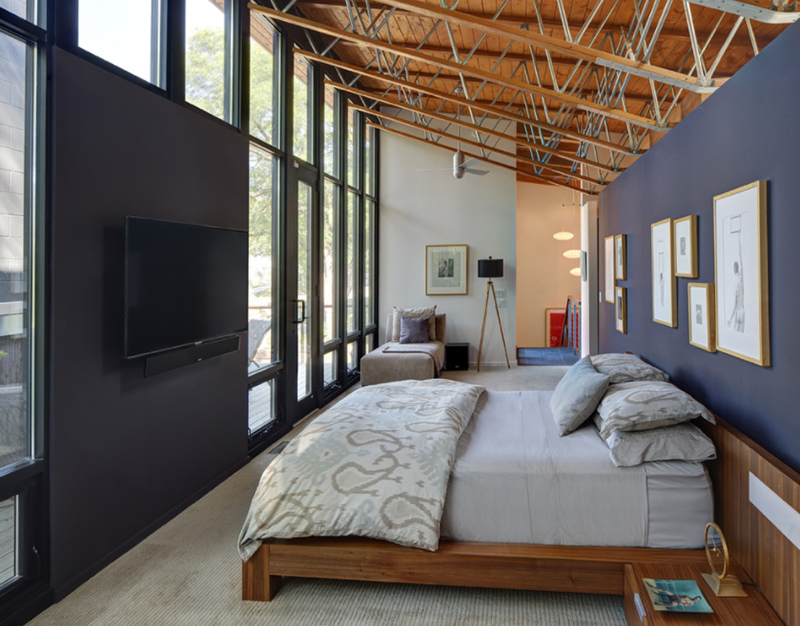 This is one lengthy bedroom that boasts an exposed ceiling which is high at the same time. 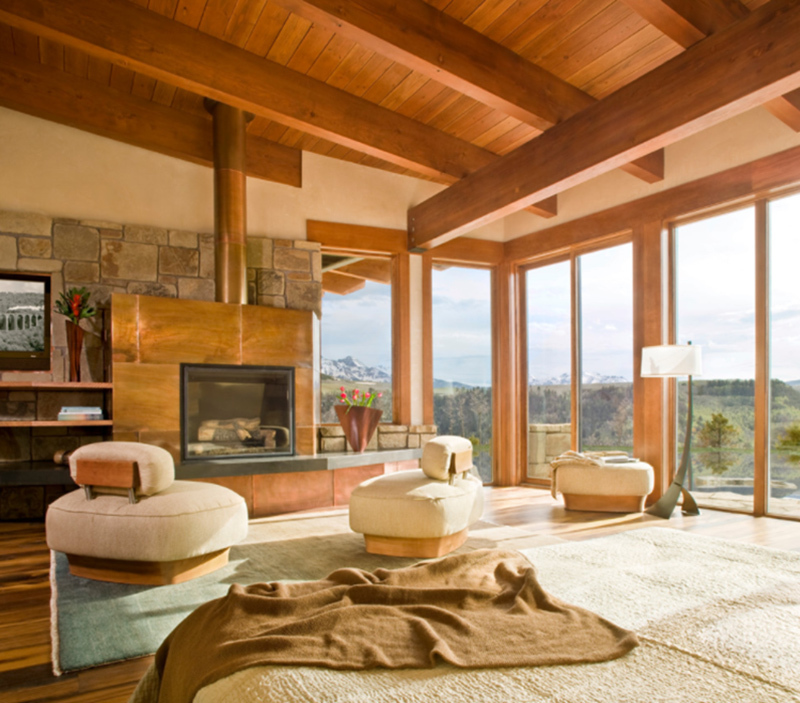 The large glass windows gives way to tons of lighting for this bedroom and the high ceiling helps with ventilation. 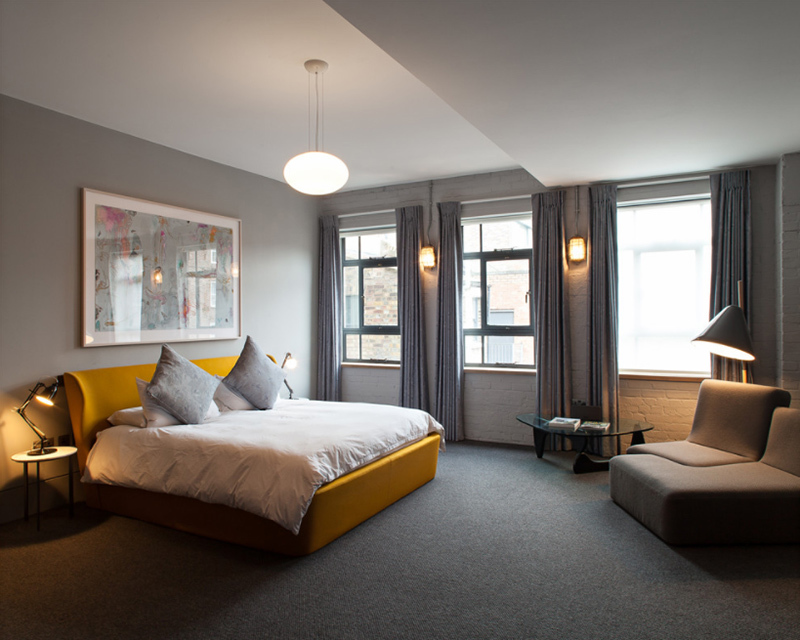 This bedroom has awesome lighting fixture choices which made this space rather appealing to both men and women. The contemporary furniture in here looks perfect. Well, what do you think about this list that we just showed you? This is a pretty pair of the 20 Contemporary Living Rooms with Black Drum Floor Lamps that I think should be handy if you decide to make some DIY project about drum lamps. If you think this list is awesome and interesting, you should share them with your friends!